The OC Register provides the news of Supervisor Lisa Bartlett’s swearing in at yesterday’s Special Board meeting in the first piece below. As I was sworn in a month early, as my predecessor went on to the State Assembly, I will have had the privilege of serving with three Fifth District Supervisors. The Voice of OC provides the discussion held at last week’s Board meeting on the proposal to move the Internal Audit Department back into the independently elected Auditor-Controller’s office in the second piece below. I could debate this from both sides, as I attempted to do this early in my tenure. But, this time I felt that it should go through a process where the recommendation is thoroughly vetted by professionals in the accounting industry. And, the Audit Oversight Committee has public members who are very familiar with the history of County and its bankruptcy (for a brief review, see MOORLACH UPDATE — ORANGE COUNTIANA — A Journal of Local History — November 9, 2012). Lisa Bartlett was sworn in Tuesday as the newest member of the Orange County Board of Supervisors, the first in a series of changes for the county’s leadership. Bartlett, an eight-year Dana Point city councilwoman who most recently served as mayor, represents the 5th District, which includes Aliso Viejo, Laguna Niguel, Dana Point, San Clemente, San Juan Capistrano and unincorporated areas like Ladera Ranch. Bartlett, the first Japanese American elected to the Board of Supervisors, replaces Pat Bates, who took office in Sacramento Monday as a Republican state senator after being termed out as supervisor. Bartlett, a Republican, was one of two new supervisors elected Nov. 4. Michelle Steele will take office Jan. 5 to represent the 2nd District, which includes Newport Beach, Costa Mesa and Huntington Beach. Steele will replace Supervisor John Moorlach, who is termed out and is considering a bid for state Senate. On Jan. 27, voters in the 1st District, which includes Westminster, Garden Grove, Fountain Valley and Santa Ana, will pick a replacement for former Supervisor Janet Nguyen, a Republican who was sworn in Monday in Sacramento as a state senator. Hopefuls have until Dec. 15 to file their candidacy. No one had done so as of Tuesday afternoon, said Neal Kelley, Orange County’s registrar of voters, but state Sen. Lou Correa, a Democrat who is termed out, announced his plans to run last month. Chris Phan, a Republican councilman from Garden Grove, also has said he’ll run, as has Andrew Do, Nguyen’s chief of staff. Contact the writer: mcuniff or 949-492-5122. Twitter: @meghanncuniff. As the 20th anniversary of Orange County’s municipal bankruptcy approaches, county supervisors are on the verge of reversing the centerpiece reform that emerged from the $1.5-billion financial disaster. The county’s Internal Audit Division – which uncovers some of the most politically sensitive cases of fraud, waste and abuse – was originally housed under the county Auditor-Controller, as in most California counties. But after the 1994 bankruptcy, Orange County District Attorney’s office investigators concluded that internal auditors were too close to their colleagues at the Treasurer-Tax Collectors’ office and did a poor job of overseeing their questionable investment purchases. As a result of a task force, numerous revisions were suggested to avoid the conditions that triggered Orange County’s financial meltdown. Yet the only one adopted was to move Internal Audit under the supervision of county supervisors along with the establishment of an audit oversight committee. The idea was simple: having the five supervisors as bosses could ensure that internal auditors would be politically liberated to conduct tough audits. Yet today, following a series of scathing audits that have uncovered fraud and waste at the highest levels, internal auditors are under heavy political fire and it looks like county supervisors are considering turning back the clock on Internal Audit. After internal auditors dived into the accounts of then-Clerk Recorder Tom Daly, who is now a state assemblyman, they produced an audit concluding Daly had used reserve accounts as a slush fund of sorts. They battled with Daly over the audit of account 12D, and he was able to delay the final audit until well after his election to the state assembly in 2012. After being elected, Daly secured legislation targeting the Internal Audit division and slated it to be moved back to the Auditor-Controller – arguing that internal auditors had become a tool of Republican supervisors bent on targeting a Democrat. When Daly’s legislation was first passed, supervisors blasted it and declared they would ignore it. Yet after internal auditors completed a recent critical audit that found more than $1 million in questionable parks contracts involving high-ranking county executives, and human resources auditors looked into a senior aide working for Supervisor Pat Bates, the move to transfer auditors seemed to be back on track. Last month, in a public showdown, two supervisors – John Moorlach and Todd Spitzer – openly questioned the move. Bates said she made the motion to transfer the department based on her extensive discussions with Interim Auditor Controller Jan Grimes and incoming Auditor Controller Eric Woolery, who assumes office next month. And it was clear that Bates – now moving to the State Senate – wanted the transfer done before she left office as supervisor. Supervisor Janet Nguyen, who also is moving to the state senate, also supported the move. “I think it’s important to hear their statements on why it’s good to approve this today,” Bates said referring to the public debate that ensued between Grimes and Woolery and Internal Auditor Peter Hughes, who is fighting the transfer. Both audit teams wrote competing position papers on the move that were presented to county supervisors. Yet a majority of supervisors balked. “I’m having some anxiety,” Moorlach said. “I’ll be opposed,” saying he wanted the matter referred to the county’s audit oversight committee for analysis before action. Spitzer also called for caution. Spitzer noted that two supervisors were prosecuted by the district attorney in the wake of the bankruptcy for failing to properly supervise then-Treasurer Tax Collector Bob Citron. Woolery argued that giving him back auditing powers was crucial. “It gives me back the second half of my office,” Woolery told supervisors. Yet former-Auditor Controller Steven Lewis drew intense fire from prosecutors and county supervisors for his role in the bankruptcy for his lack of independence and oversight. “The Treasurer embezzled interest income from the participants of the commingled pool without any detection by the Auditor-Controller. The lack of detection was due to the cursory nature of the accounting methods used and supervised by the Orange County Auditor Controller,” was one of many conclusions of a confidential 75-page investigative summary on the bankruptcy produced by the Orange County District Attorney’s Bureau of Investigation in 1997. “Had Lewis performed his supervisory duties, it would have been obvious that the interest being reported as being earned by the Specific Investments actually included interest being skimmed from the commingled pool,” read the conclusions of district attorney investigators. Although the Auditor Controller was aware of the dangers of Reverse Repurchase Agreements as early as 1988, he failed to take action necessary to assure that the accounting methods of the Treasurer would accurately reveal that status of Treasurer investments. This lack of supervision eventually resulted in a liquidity crisis when the county was unable to produce the necessary cash to meet its obligations to broker-dealers demanding collateral under their reverse repurchase agreements. Even though Steve Lewis was not a certified public accountant, he supervised a large staff. 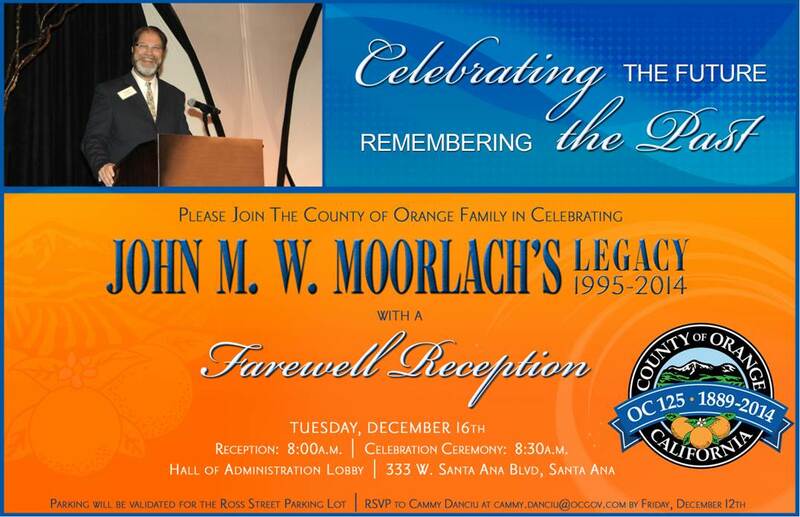 Many of those staff members had functions, which included review and supervision of the Orange County Treasurer’s Office functions. That staff did not function efficiently or adequately in fulfilling the mandate of the Auditor Controller. County Counsel Nick Chrisos publicly told supervisors last month they did not have to heed the mandate of Daly’s legislation. “Either the current model or the proposed model are perfectly legal. It’s strictly a board call,” Chrisos said. Internal Audit Director Hughes told the board that having internal auditors report to them was important. Ultimately, supervisors voted 3-2 for a temporary delay moving the issue back to the audit oversight committee, as suggested by Moorlach, for a full debate at it’s next monthly meeting in January. One stark warning from the 1997 district attorney’s report on the importance of accountability is particularly relevant to today’s debate.